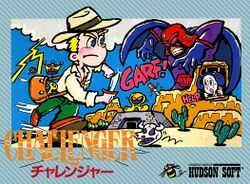 Challenger was a game for the Nintendo Famicom, written by Hudson Soft and released only in Japan, in 1985. In the initial part of the game, the player must run along the top of an express train, jumping between carriages while avoiding enemy bullets and obstacles. When the player has reached the end of the train, they enter the train, and must proceed through the carriages, towards the front of the train, so that it can be stopped. This bears great resemblance to Hudson's ZX Spectrum game Stop the Express, which was first published in 1983 by Sinclair Research Ltd, and also available for the Commodore 64 and the MSX. The three subsequent stages involve gameplay that, while slightly similar to the first stage, feels disjointed and unthematic. The game was re-released in 2005 as part of the Game Boy Advance compilation Hudson Best Collection Vol. 3. This page was last edited on 15 June 2013, at 03:32.